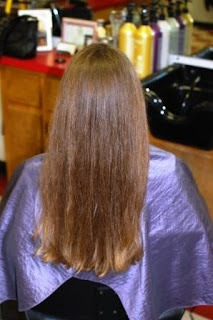 Hair donation, specifically Locks of Love, those words excite and frighten me equally. I have always loved the idea of people donating their hair. Other people...not me. SuperMom and I were chatting about the 30-Day Giving Challenge and I told her that I have felt really called this year to think outside of the confines of "normal" giving. I have felt like I need to think about doing things that are uncomfortable for me to write about and to do. I told her my plans for becoming an organ donor, giving blood, milk donation, and...before I could say anything else, she blurted out, "donating your hair!" She said that she had thought about me donating my hair before and wondered why I never had. My husband loves my long hair and it's really all I've ever known. I have only cut my hair short-ish twice in my life and both times were regrettable. Really regrettable. As we walked along, I started choking up while I was talking to her about it. And then I felt silly for doing it. I mean c'mon...it's just hair. 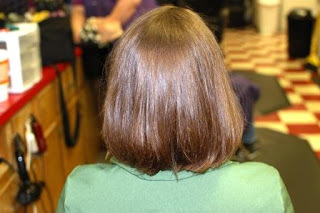 Just hair that kiddos in chemo or with long-term medical hair loss can't grow. Just hair that will put a smile on someone else's face. Just hair that makes a child in an abnormal situation look and feel a little more "normal." So maybe it's not just hair after all. I don't know what to do with short hair. But I guess I'll have to learn. The thing is, hair grows back. And let's face it, half the time mine is covered up with a fabulous hat anyway. If you have long hair please consider donating it to Locks of Love. Oh, now I'm all choked up. A seventeen year old girl we know who is being treated for lymphoma just got a donated wig to wear to prom. That's what gifts like yours do! Thanks for sharing that Ms. Kristin. When there is a personal connection to a gift, it makes it that much more impactful. All the cool kids donate their hair! Congrats! It's a nice feeling to do something so completely useful. I did a donation a few years ago and I am so glad I did! Your short hair in the past was not bad! I think you look great no matter what. You are truly beautiful for the things you do EVERYDAY! So blessed to have a friend like you! You are such an inspiration to me. I have the best friends. :) The feelings are mutual Ms. Cindy. my youngest daughter has done the hair donation 3 times already and is considering the 4th. it's not just hair. it's a gift. thank you for doing it from someone who has a dear friend who is now beating cancer. God bless all. Wow! That's amazing! What a sweet daughter you have. Sending prayers up for your dear friend. I think your donating your hair is a cut above! You are such a generous person! I wish there was a like button to click for all these wonderful comments! That would be great Ms. Penny! In the future you might want to try another hair donation organization. The majority of hair donated to LoL winds up in the garbage or being sold to hair extension makers. The fact is, very few people have the type of hair that make quality wigs. Also, very few of the wigs they make ever make their way to children with cancer and they are not free. I'm not trying to make you feel bad. I just think if your going to chop off all that hair, at least make sure it goes to right place. I've heard much better things about Wigs for Kids and Patient Beautiful Lengths. I think I have a while before I'll be able to donate again (it took a long time to get it where it was). :) I will look into the other charities you mentioned. Thanks for the information Ms. Sharon.